Preserving America’s colorful Canal era and transportation history, the Chesapeake & Ohio Canal National Historical Park is 184.5 miles of adventure. Originally, the C&O Canal was a lifeline for communities and businesses along the Potomac River as coal, lumber, grain and other agricultural products floated down the canal to market. Today millions of visitors hike or bike the C&O Canal each year to enjoy the natural, cultural and recreational opportunities available. Take a look at a large scale map of the area. 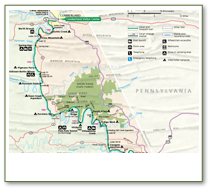 The Chesapeake and Ohio National Historical Park includes 19,236 acres paralleling the Potomac River from the densely urbanized Washington D.C. upriver for 184.5 miles through pastoral farm country and forest to Cumberland, Maryland. Many of the park’s three million annual visitors come here to enjoy the outdoors, access the river, hike and bike, jog, ride horses, and observe wildlife. The natural resources provide scenery and backdrop to our daily lives. Found along the second largest tributary of the Chesapeake Bay, these natural resources are also an important part of the larger bay ecosystem. Much of the park preserves floodplain forest and wetlands that contribute to the conservation of the Chesapeake Bay. The forest and wetlands can act as a “sponge,” slowing down the flow of water during floods. Plants in the forest and wetlands can also absorb (and use for their own growth) some of the many nutrients that run off surrounding lands in the Potomac River watershed. This can lower the amount of “excess nutrients” that can harm the river’s and bay’s ecosystems.